The real question is: does Cory Gardner think New York City was part of Germany in 1905? Well. Cory might be able to support that position. "Of the foreign-born population (1,270,080) in 1900, more than one-fourth (322,343) were Germans; more than one-fifth (275,102) were Irish, nearly one-eighth (155,201) were Russians, principally Jews; more than one-ninth (145,433) were Italians; and the next largest numbers were: 71,427 from Austria, 68,836 from England, 31,516 from Hungary, 28,320 from Sweden, 25,230 from Russian Poland, 19,836 from Scotland, 19,399 English Canadians, 15,055 from Bohemia, 11,387 from Norway, 10,499 from Rumania, 8371 from Switzerland and 5621 from Denmark." I'd like to hear what Moderatus/PodestaEMails, Andrew Carnegie, and Powerful Pear have to say about Trump's statement that wind turbines aren't made in the USA. Heck, one of them might even be driven to say, "Trump Stinks!". Whatever Trump says. They are Lemmings for Trump. I wonder if Cornholio is back in jail for more domestic terrorism actions with his white supremacist buddies. Poderamus is probably still in a state of shock over the restoration of the House of House to the state party organization. Yeah. Considering his feelings about House, that must sting. Hard. Not to mention his other statement about the night the wind was not blowing and an electricity consumer was unable to watch TV that night for that reason. Donald J. Trump: . . .
. . . bird lover! The spirit of Alfred Hitchcock lives on…. I just want to know, what did he do to make the birds bate like that? Probably the same thing he did to make the babies cry – be an inherently untrustworthy and unstable person. That is a classic photo! WaPo says "President Trump has made 9,451 false or misleading claims over 801 days"
So it isn't as if Cory Gardner has a shortage of things he could correct, and thus "stand up to Trump." I don't follow Gardner obsessively, looking at every tweet, newsletter, facebook post, news conference or published interview — but I cannot recall Gardner EVER saying Trump isn't telling the truth. [S]o I'm going to give him some leeway when he criticizes alternative energy. Because I've gotta do it with 85 percent of the people that are new since we developed all of this and they think it's stupid that we have wind and solar and everything else, except for a few progressives," Grassley said. This "windmills cause cancer" meme is straight out of the right wing fringe press. It's being rapidly passed around the social media feeds of our local RWNJs, including the Independence Institute's Amy Oliver. In 2015, a farmer in France claimed that windmills were causing a drop in milk production in his dairy herd. He also claimed that the cattle were "getting shocked" and picking up their feet in unison (I'd like to see that – sounds like a Disney movie in the making). The latest lie about wind power is that it kills cows. These are both scams, of course. The French farmer who hopes to be able to sue wind and solar plant manufacturers for big bucks. The farmer claims that the cattle are being electrocuted from DC voltage leaking into the ground. News flash – all solar and wind equipment, like all electrical equipment, must be fully grounded according to the relevant electrical codes. To date, there is no evidence of harm to human or animal health from wind turbines, especially compared to harm from air and water pollution from fossil fuels based energy production. Some wind plants are noisy, especially the earlier models, but a review of the literature in 2013 found no evidence of "wind turbine syndrome". Donald Trump, of course has a grudge against windmills after failing to stop an offshore wind plant that he claimed blocked the view from his Scottish golf course. 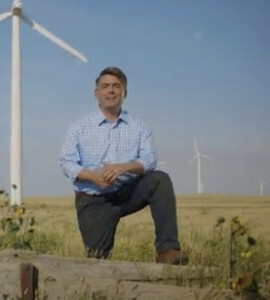 Cory Gardner is disappointing. He used to be at least somewhat grounded in science, and when he's not trying to kiss up to Trump, has promoted stem cell research and other pioneering scientific and medical advances. I am thinking it couldn't take more than a handful uf lightning strikes to discharge more voltage into the ground than all the manmade systems in the world, much less just wind generators. …we have to start really going after this culture of lies Cory represents. It is way past time for the truth to be at the top of our list of things we seek. Actually, Duke, visible lightning discharges travel from the ground to the sky. Ergo, they don't add voltage to the ground, they dissipate it to the heavens. Notwithstanding this fact, Trump still stinks. I stand corrected. Thanks, V.